By hungry runner on December 11th, 2010 . Filed under: Gifts, Kitchen . Still searching for a gift for the cupcake lover in your life? 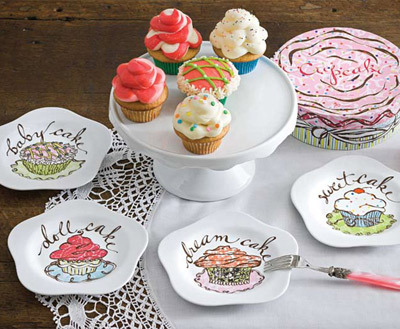 How about these cupcake dessert plates available from Layla Grayce. The set of four petal shaped plates, each measuring six inches in diameter and featuring a different design costs $40.00. the box these come in looks cute! I am brazilian and I loved these dessert plates. They are cute! My next trip to USA, I will try to buy them!